In my office building, as soon as I hear rain on the roof, I get all excited and rush to my computer screen. Yes, you’d think I’d go to the nearest window, but they’re all up the other end of the office and as the receptionist, it’s preferred that I’m at my desk to answer the phone and greet visitors (they let me off my leash for short toilet breaks, otherwise it’d get too messy). No, in all fairness, I’m treated pretty well at work, apart from a distinct lack of windows in my region of the office. It’s just that like many others in our (occasionally) fair city, I’m obsessed with the weather, and therefore with the BOM. Hmm, yes, we are a bit obsessed! But Melbourne is rightly famous for its changing weather. It can be 40 degrees C (104F) by lunchtime, then drop 20 degrees in an hour or two, plus start a downpour – a cold one, not a tropical one. Occasionally this is accompanied by hail and/or howling winds. It was changing a lot even before climate change reared its ugly head. Now it seems to have added a few extra seasons onto the official four that the European settlers pasted onto the Australian calendar – perhaps it’s added even more than the seven or so seasons which our indigenous people recognise. However, we can rightly say that for Melbourne Cup time, in late spring when the roses start flowering, visitors should not worry so much about how their fashion looks and more about whether it’s waterproof, sweatproof and hailproof. Umbrellas are optional, they may blow away. Bring a blanket, sunscreen AND gumboots (Wellingtons, galoshes, rubber boots), or someone to carry you through the mud. And even while we celebrate the race that stops a nation, we’ll watch the TV images gleefully and say, huh, that’s Melbourne for you! 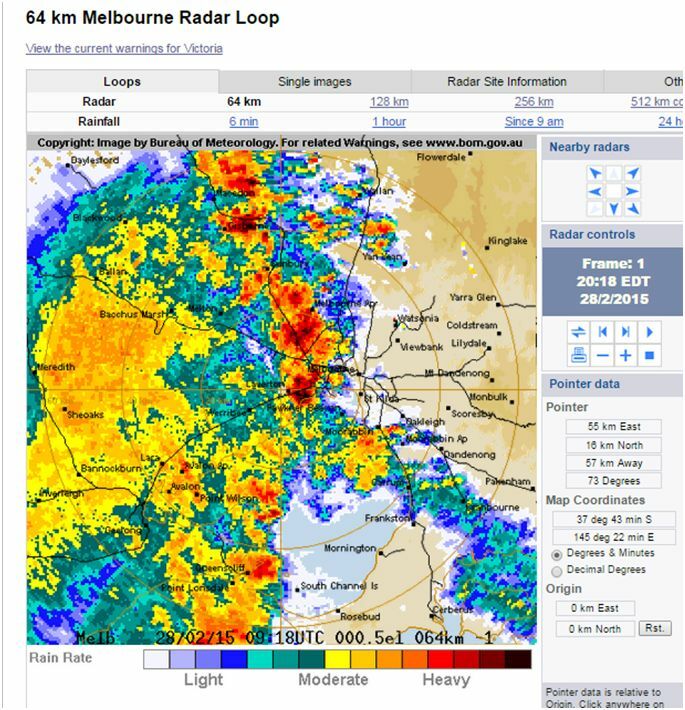 This entry was posted in Technology and tagged BOM radar, indigenous seasons, Melbourne Cup weather, Melbourne weather, Obsessions, technology, Weather, windowless office workers. Bookmark the permalink. 2 Responses to It’s da BOM!